If your business is subject to OSHA recordkeeping requirements, you are required to keep records of employee illnesses and injuries on approved OSHA accident report forms. 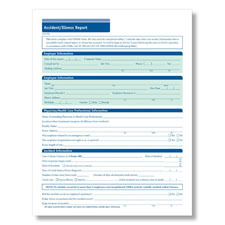 This OSHA Accident/Illness Report is perfect for recording each incidence. The Accident/Illness Report (equivalent to OSHA Form 301) can be used to keep this supplemental record of occupational injuries and illnesses. 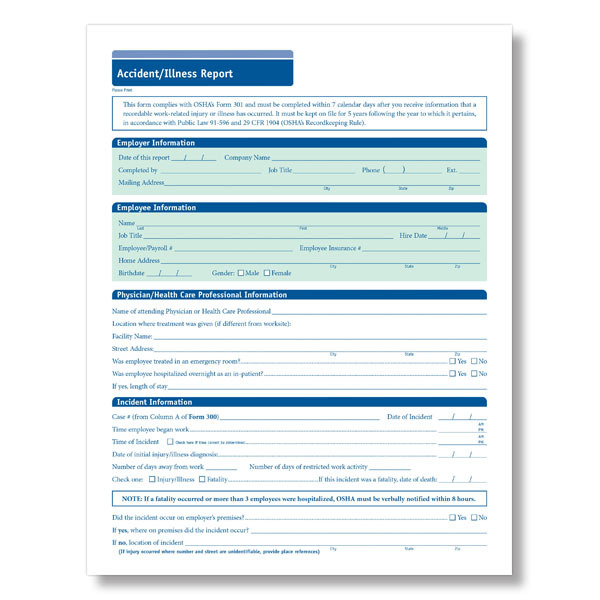 Used in conjunction with OSHA Forms 300 and 300A, the Accident/Illness Report can be used to satisfy most recordkeeping requirements relating to employee illness and injury. Recordkeeping note:The law requires that OSHA Accident Report Forms and Illness Report Forms (Form 301) be kept in the establishment for five years. Failure to do so can result in citations and penalties.